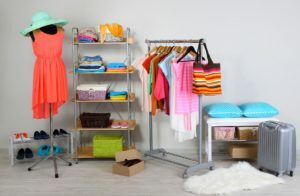 Here is a great place to start; know what you already have in your closet. It is hard to know what we need if we aren’t aware of what we have. Step 1 is to take an inventory of our closet (s) and drawers. It is highly likely that we will find clothes that we have forgotten we had. And when we do an inventory, this can give us creative, new ideas of how to combine our outfits. Following up on number one, we can use our creativity to imagine new and different combinations, to create a new look or style with what we already have. Is there a new way to wear that skirt or those jeans that we had forgotten we had? Try out new combinations and you may find that you have a bigger wardrobe than you thought. I like to “winterize” my summer outfits. This works surprisingly well. It is a tip i learned from my African friends now living in Canada. Why not take a bright summer dress and add warm black stockings to give your summer outfit a colourful winter look? Shorts can be worn in the winter with the right stockings and, by adding a warm sweater, you can create a cozy fall or winter look. Machine washing does not mean “gentle” washing. In fact, washing machines and dryers can be very hard on our clothes. One look at the lint filter in the dryer will tell us how our clothes are being “eroded. ” The dryer is amazingly harsh on our clothes. Why not try the delicate cycle (and cold water, when possible) and consider clothesline drying. As an added bonus you can save money on electricity. I love thrift stores. There are so many hidden treasures and, when you take the time to look, you can find some very good quality clothing. When shopping at thrift stores, flexibility is important as well as having a colour scheme (basic is always best). Go in with a general idea of what you are looking for, but be open to new possibilities. Look for quality over quantity and go with a conservative colour scheme. Accessories can change it up for you. Does this sound familiar? We do this for grocery shopping so why not apply this to clothes shopping as well? When we set our limits and stick to them, we are far less likely to be swept away by passing sales and more easily able to say no (to ourselves). It is important to know what we actually need (hence the list) and to have a plan. And, when we get to the mall or store, we need to be prepared to come away empty handed. We need to be careful about buying items just because we have this on our list. Sometimes we may have to wait until we can find what we need at a price we can pay. I personally like to go with a basic black and/or navy blue (I’m conservative). It is just so much easier to match outfits and shop for additional items to add to the wardrobe when there is a basic colour line. There is also a lower probability of ending up with mismatched clothes and a limited way to wear them. It is important to think about mileage (ways the item can be worn) when buying clothes. 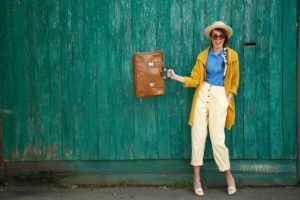 Think about how to expand your wardrobe with minimal spending. This is simply a great idea to get maximum wear. Why not pass on the style to another so that they can create their own new style with the same clothes? I think clothes always take on a new look (personality) with different people. Clothing swaps are a fantastic excuse to get together with friends and save money in the process. “On sale” does not always mean “on sale”. Usually, at the beginning of a season, clothing is marked up above the actual value of each item. Then, as the season progresses towards its end, the clothing is “marked down” closer to its actual price (or value), so it doesn’t necessarily mean you are getting a good deal. Sales are more about clearing inventory than they are about saving the customer money and getting value for their dollar. I am not a fan of shopping malls – just putting that out there. That’s just me. Some people love their convenience. There’s a lot of temptation with all the variety of stores and enticements to “stay a while”. We may go in with the intention of not buying or buying very little, but it is very easy to spend money there that we did not intend to spend. What tips do you have for saving money on clothing? I would love to hear from you. Thank you and glad you found this information helpful.